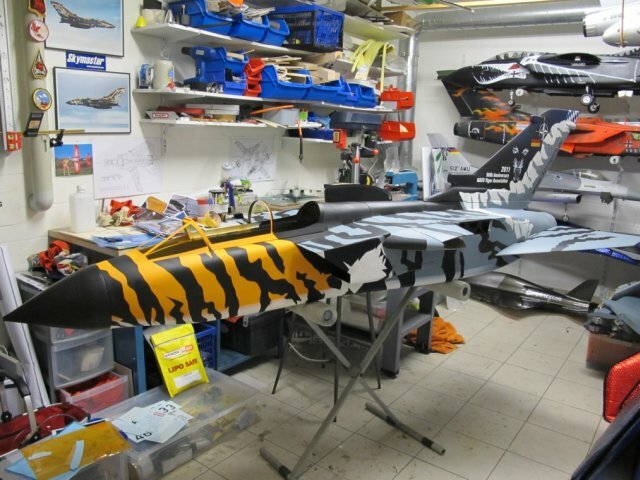 After having build and flown three TORNADO ECR models in "322 Moster Look" I searched as a model builder for new challenges. 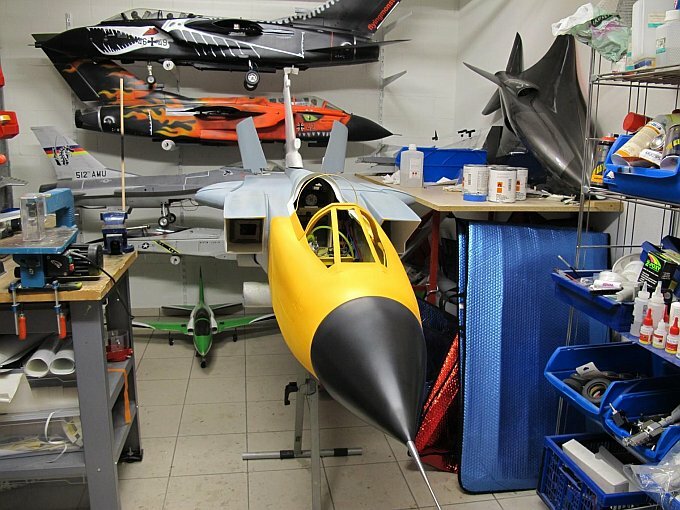 In most times the models get larger and more challenging in construction and so it came that now a clean raw TORNADO in 1:6 scale is found in my model shop. 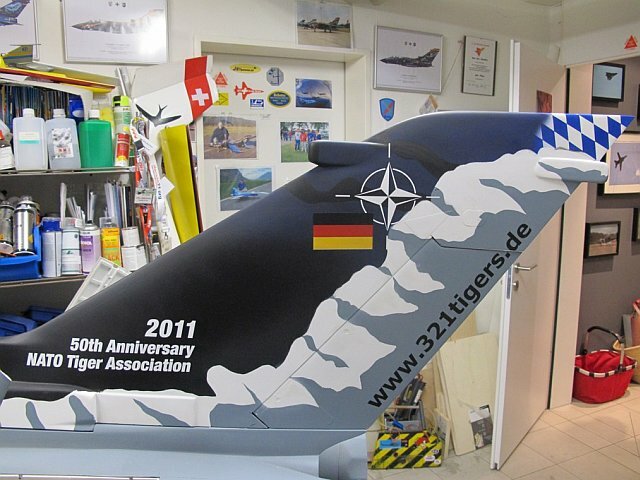 Since the "Monsters" degenerated more and more over the years I switched to the 321 Tigers. 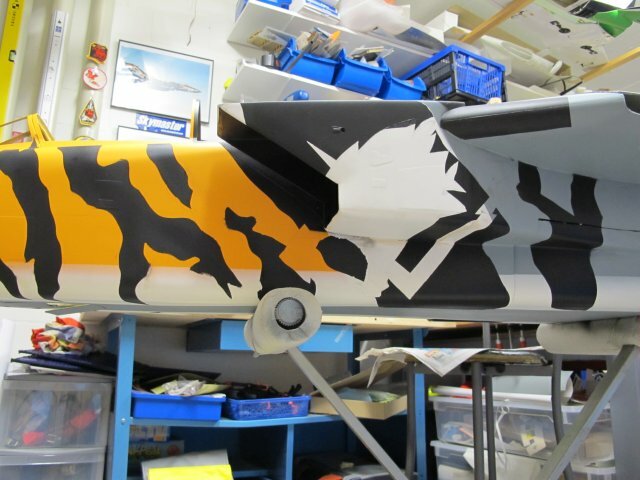 The Tiger webmaster Claus, the designer of the 2011 Tigerjet Tom, the airbrusher Joey and the whole squadron supported me and my project in an excellent way, so that I can now start to realize this extraordinary and pretty design with its complex special painting as a model. 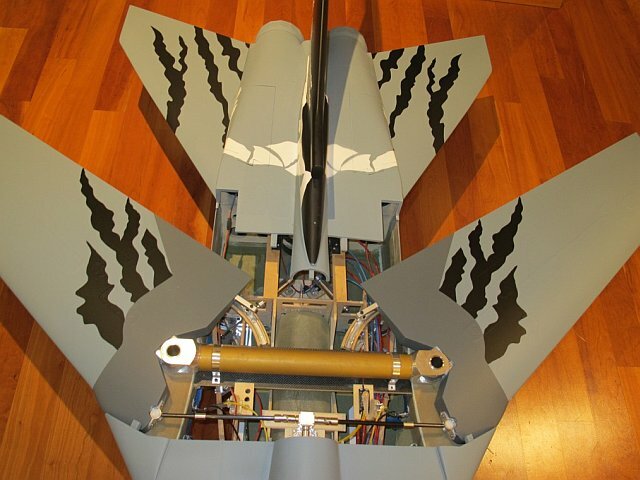 The "guts" and the technical equipment are mainly installed. 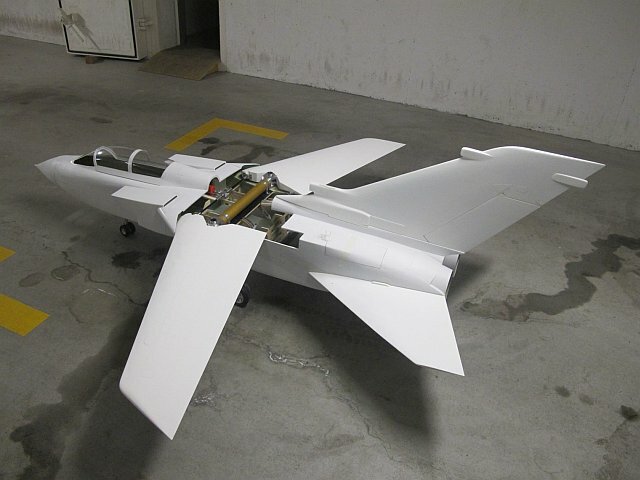 On the left picture you see the pneumatic refuelling system and controls which are under the radom (nose) of the model. 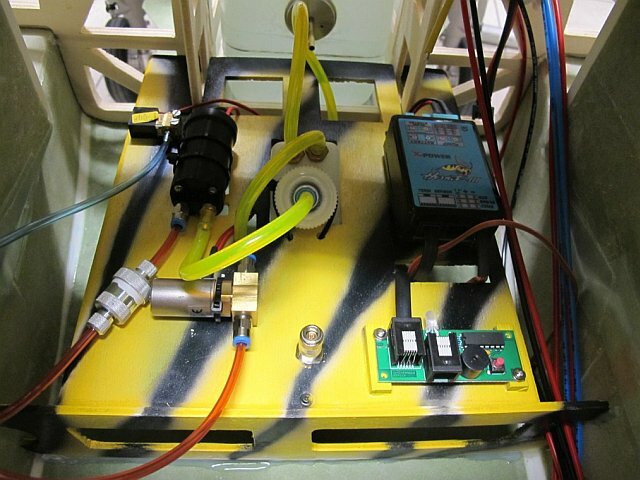 The tiger-like board shows the complete turbine control electronics, the fuel pump, the valves and the tank system. The tanks hold altogether exactly 5 liters jet fuel, which is good for a 8 minutes flight plus fuel reserve. I struggle on and get confronted with new problems now and then. 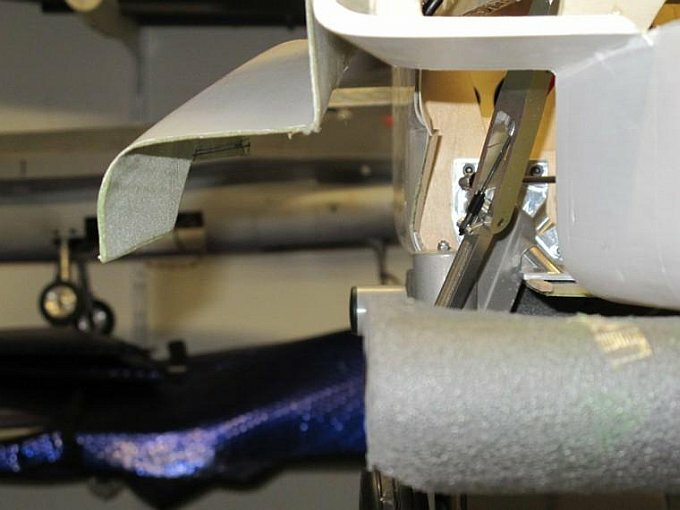 Yesterday I stiffend and coated the inside of the speedbrakes. 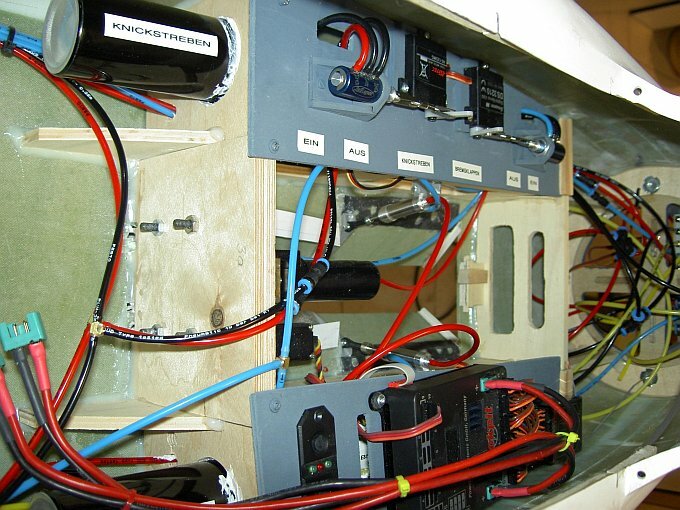 Meanwhile, middle of October 2011, all gear doors are attached, the rods connected to the cylinders and the airpressure tubes installed. 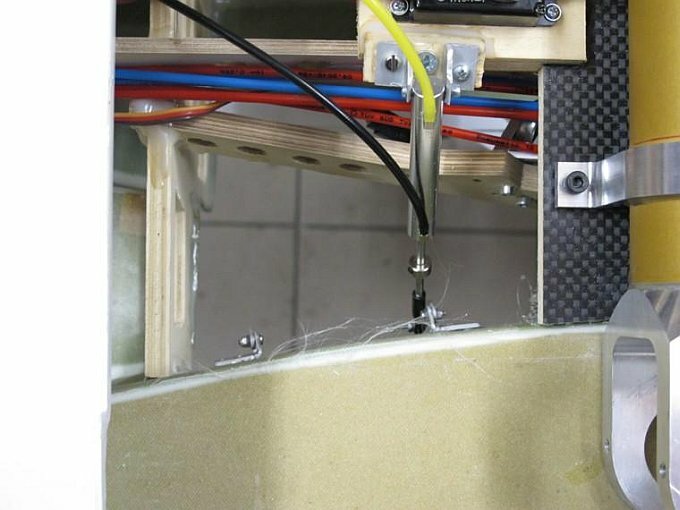 Overall I have used around 18 meters 3mm Festo line for all airpressure driven funktions of the jet. 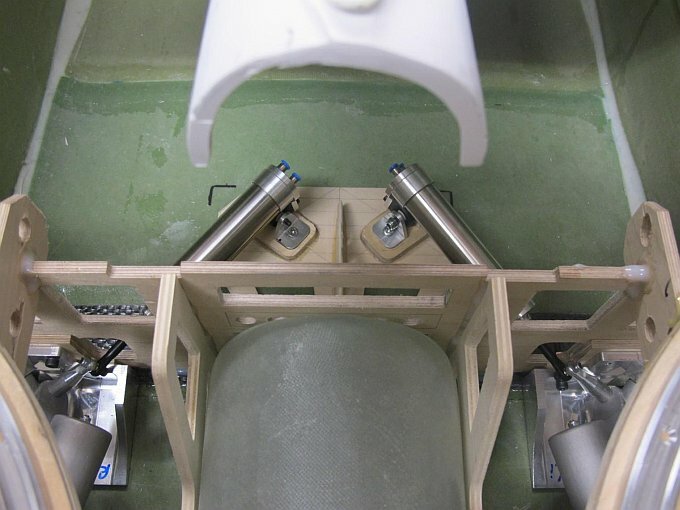 The big main and front gear cylinders, the geardoors and the wheelbrakes are controlled by an electronic multifunction valve which is situated in the radom (nose). 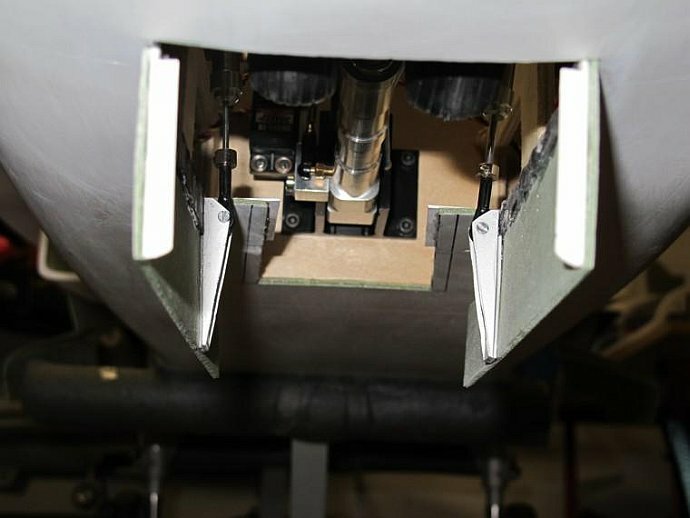 The drag struts of the main gear and the airbrakes are driven by mechanical valves which are mounted on the left console of the cockpit. 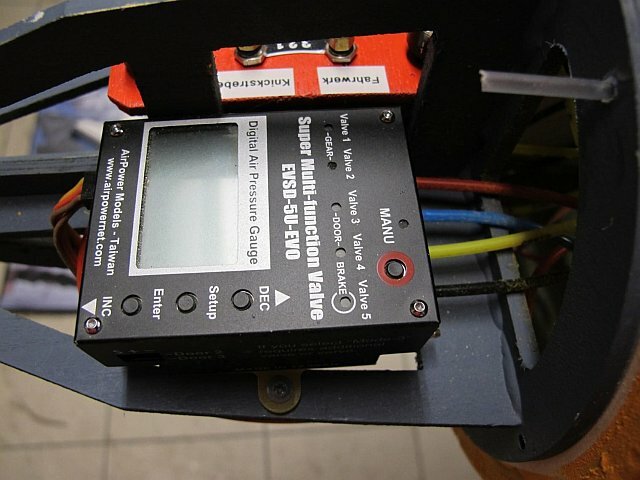 On the right console of the cockpit is an electronic bandpass filter and the receiver which routes the controll signals coming from the sender to the model. 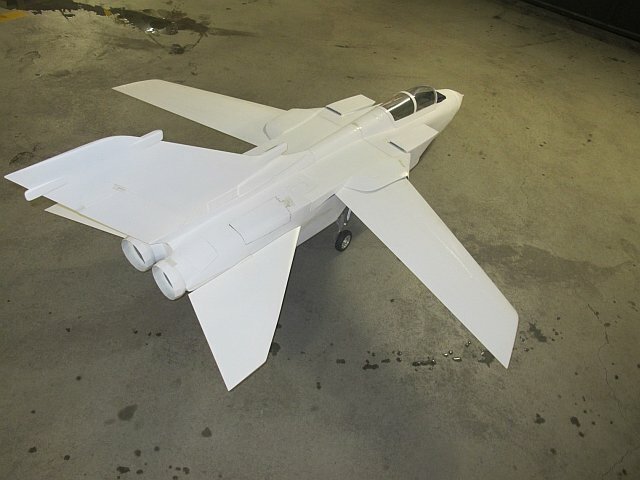 In contrary to the big jet which was in an error deliverd totally in black to the paint shop could I start an easier coloring with a white base color. 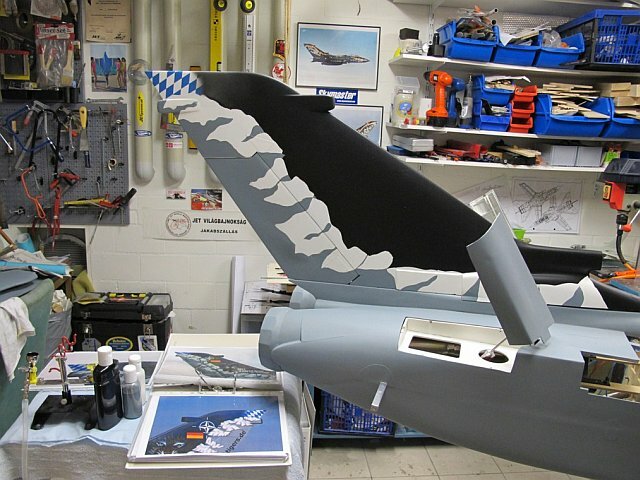 To copy the coloring on the fin as exact as possible is it important on the first hand to find the exact positions of the complex color lines. 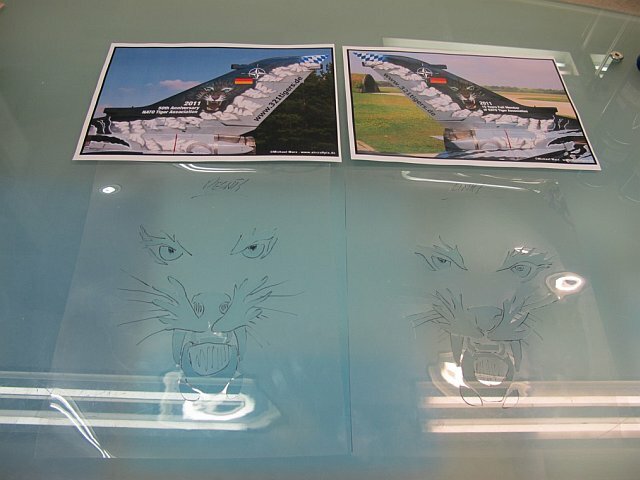 For this purpose I selected the best picture and had it magnified to the exact 1:6 scale. 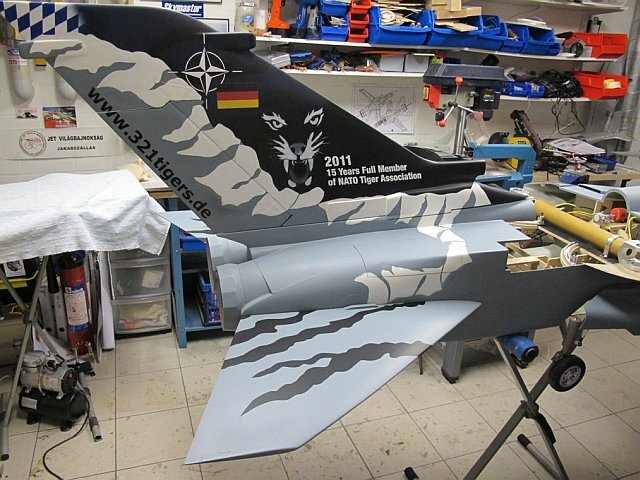 Thanks to Michael Marx of aircraftpix.de for his excellent pitctures. 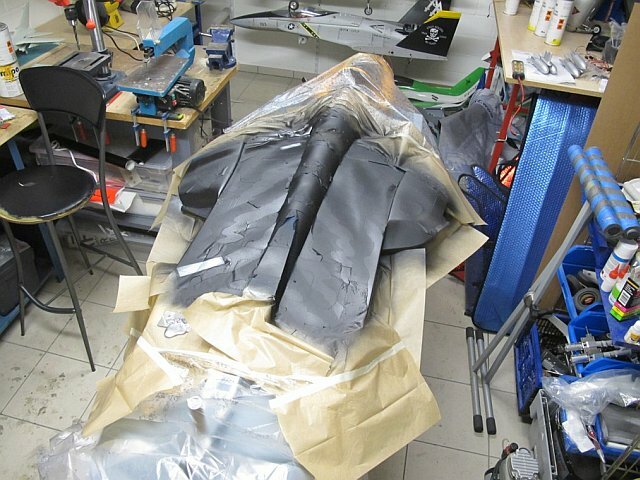 After that the black contours were brought onto the fin with pencil. 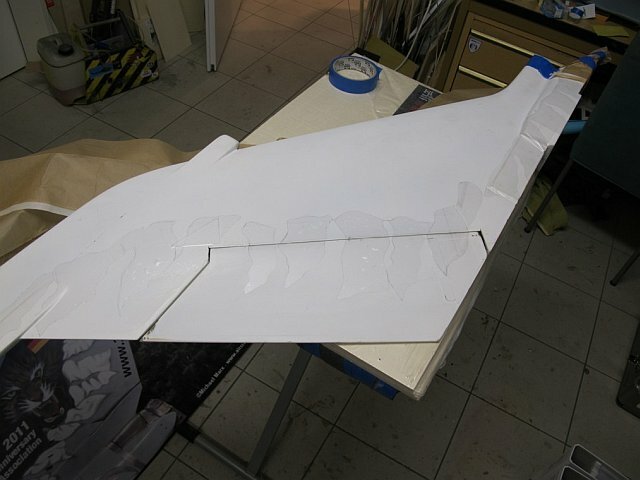 Next I cut out the strippings and brought their contours onto the fin. 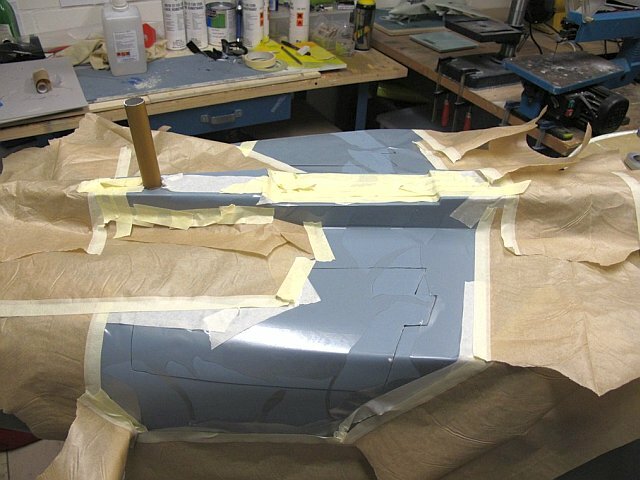 Before covering the whole area I had to do some correction work on the surface with fine plaster. 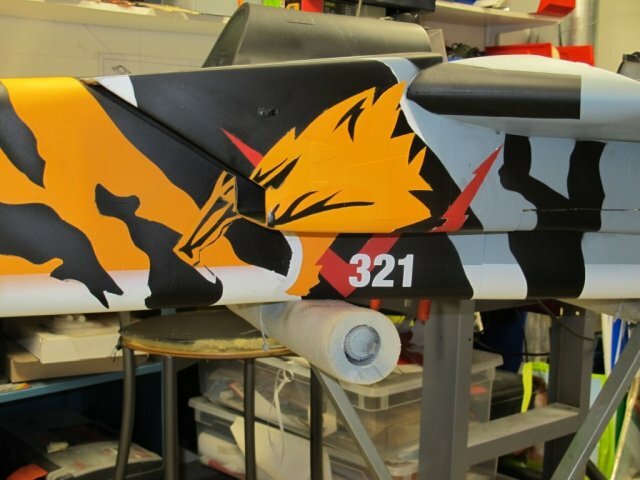 After that I cared about the squadron emblems underneath the canopy bubble. 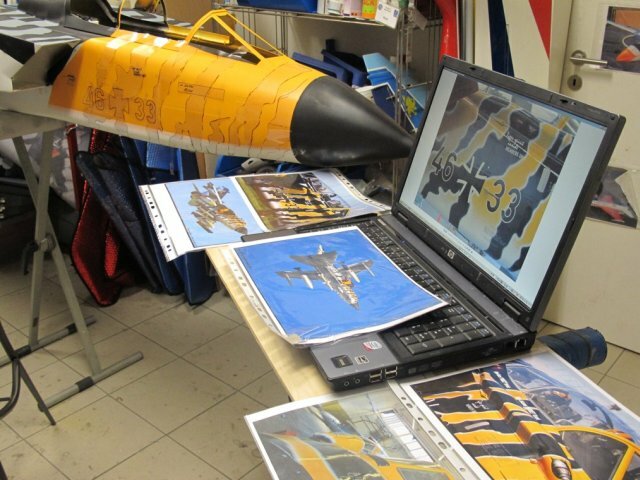 Thanks to Tom Marschik the designer of the tigerjet who gave them as high resolution images to me. 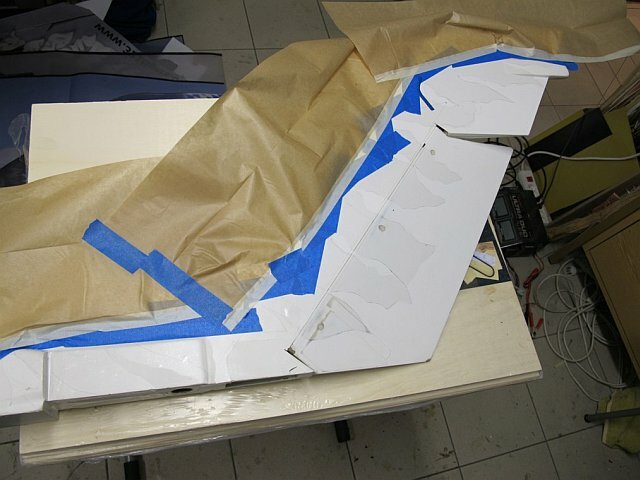 Some more resizing a cutting exercise and then I can start adapting them to the fuselage. 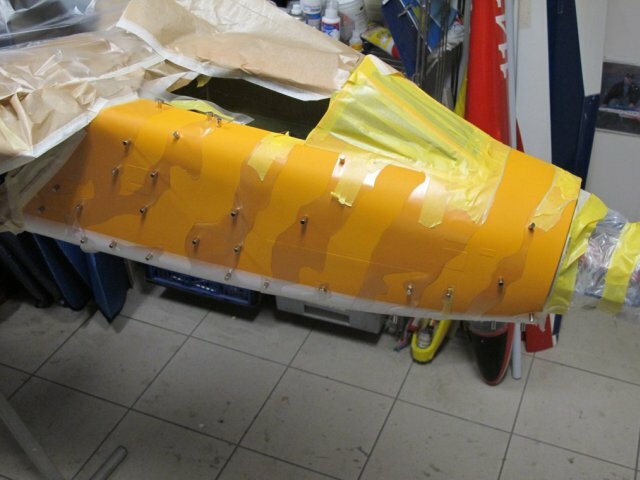 The filling works are so far finished and now I want to explain in more detail the paintworks on the tail. After that the contours of the delaminations were pre-painted I masked them with a transparency foil and cut along them with a sharp knife. Now it was time for the bavarian type diamonds. 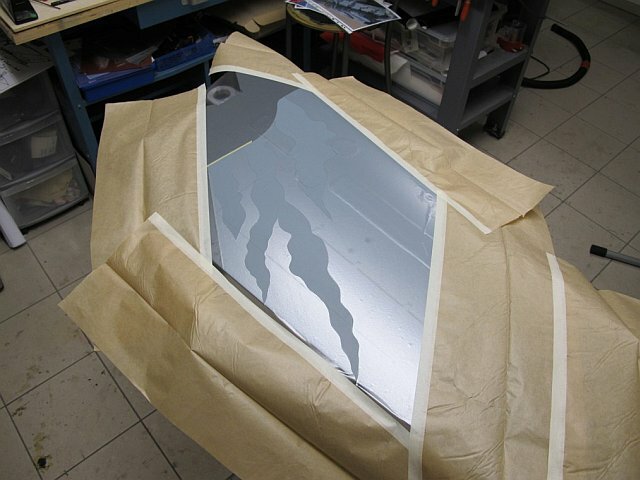 Also here the 3M masking foil came into action. 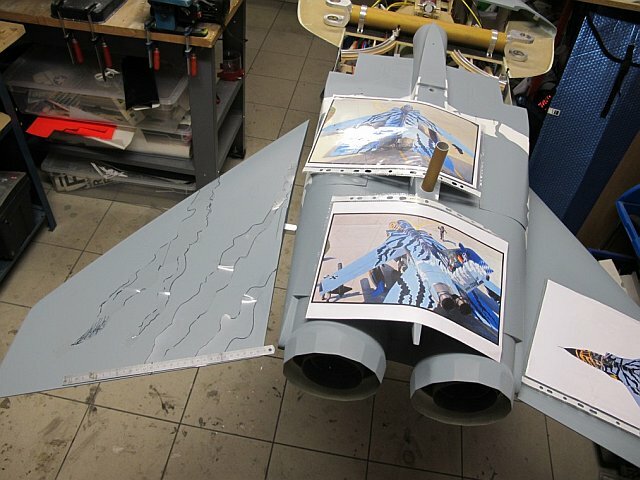 When everything was nicely dry and I spray coated on a piece of paper the blue grades (like on top of the tail) as a test I noticed a remarkable discrepancy in color. I found out that I had choses a wrong blue color. 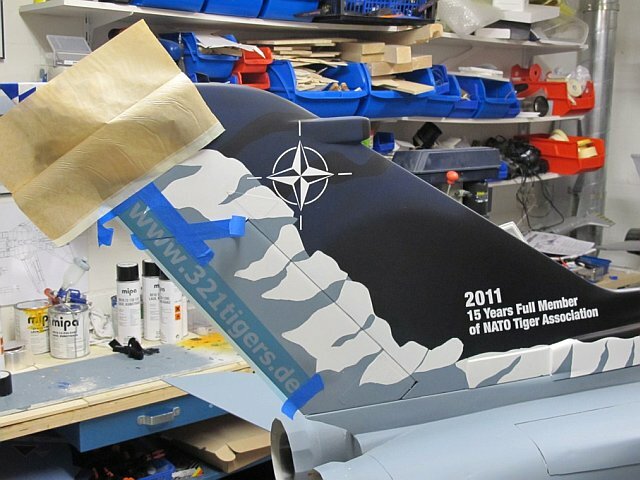 When I had visited Lechfeld I have seen the tins with light-blue (RAL 5012). 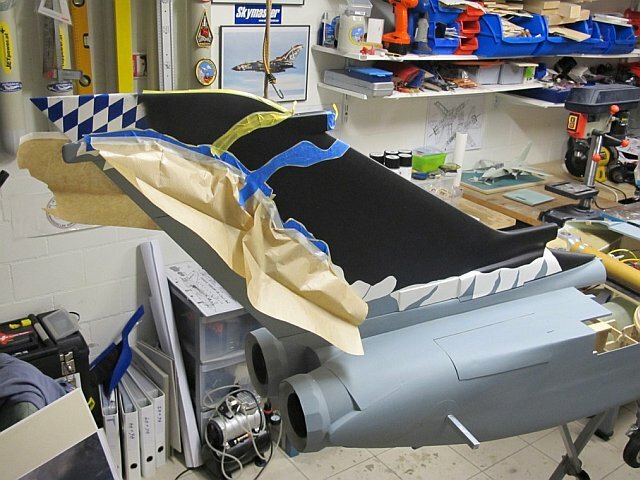 I supposed that this was the blue color for the tail. 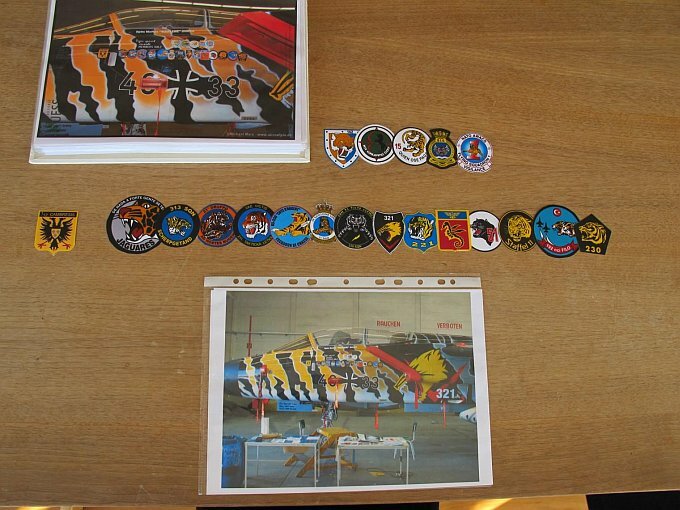 Finally I learned that those were the cans which Joey used for parts of the squadron crests. 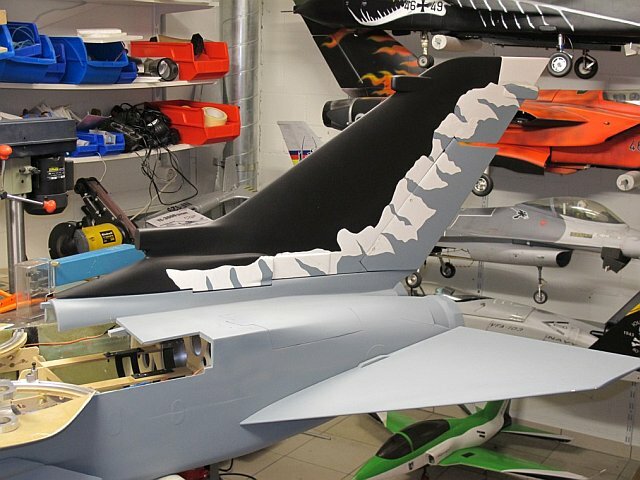 The blue color for the tail is called ultra-marine blue (RAL 5002). 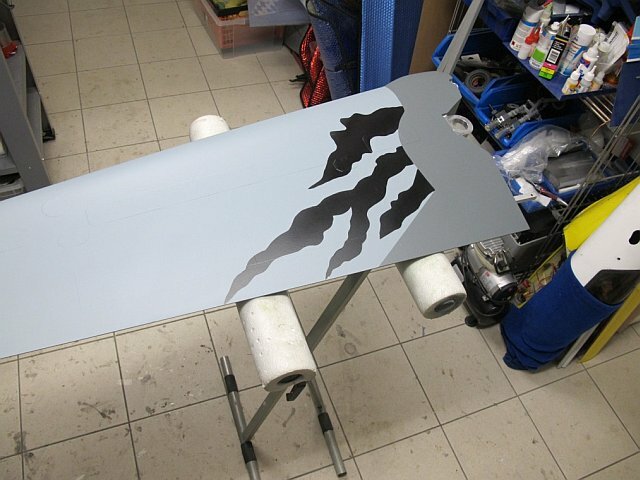 Following that and when I had ordered this color I could correct my mistake. Now I continued with the writings. 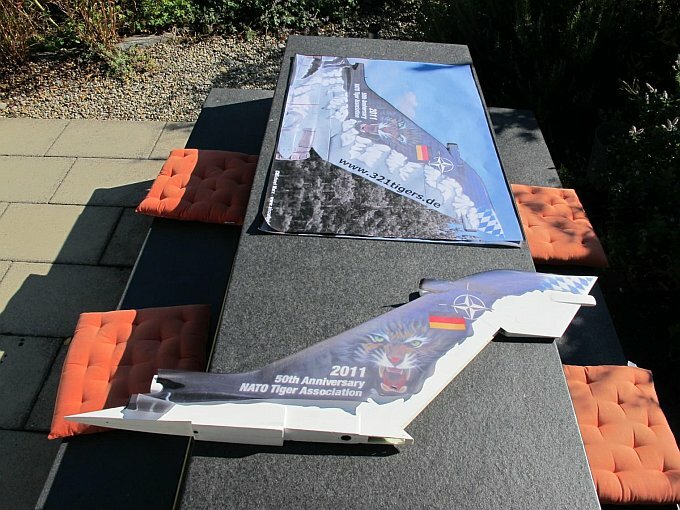 The NATO sign and writings are plotted with a special white foil. 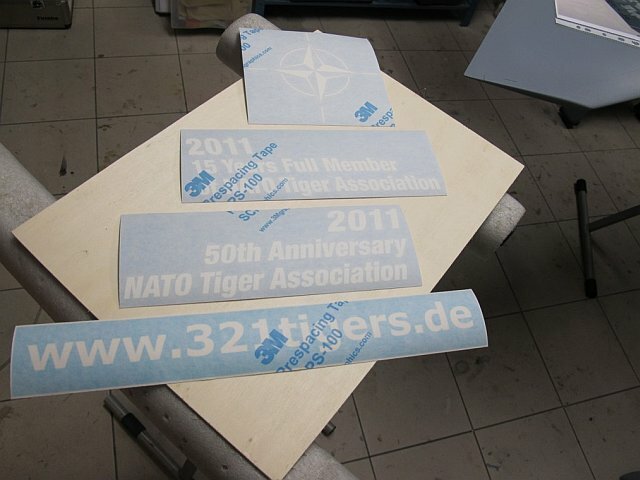 The 321tigers.de writing again is made of masking foil which together with black color creates the line. 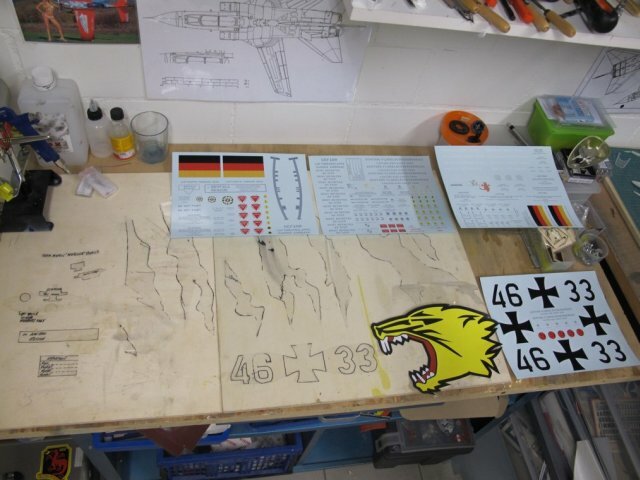 The introduction of the white base-coat for the tigerhead was done with selfmade masterplates. 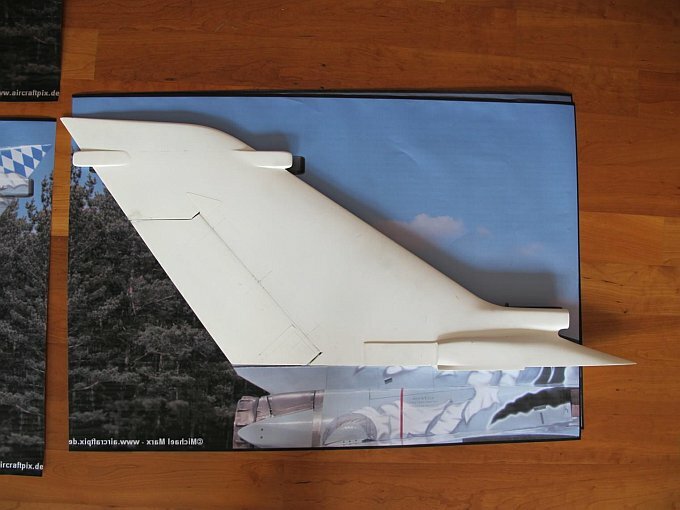 The outlines were taken from the 1:6 scale printouts of the tail. 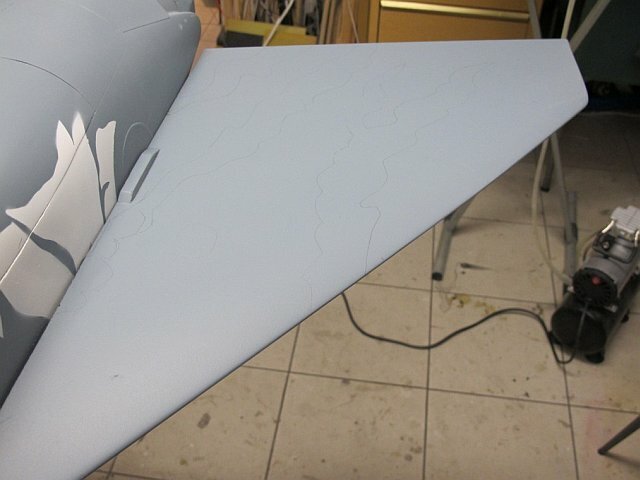 Joey had brushed on the big bird everything freehand. 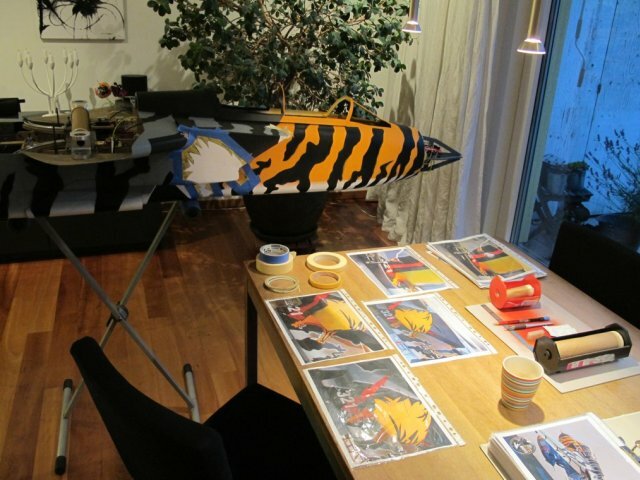 The tigerhead is madeup of different colors. 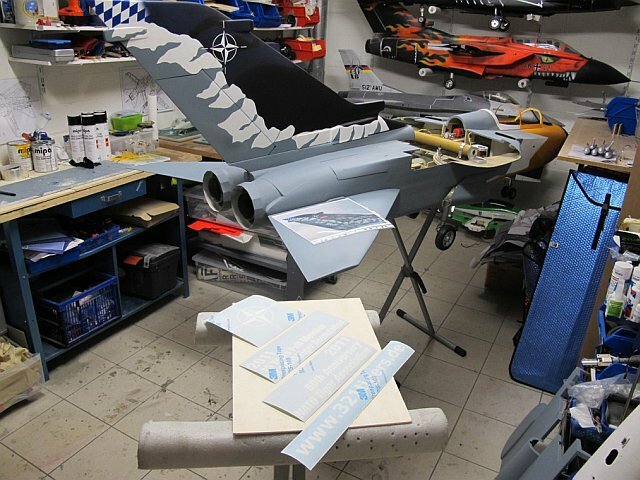 Here I worked for the first time with water soluble airbrush colors on this project. 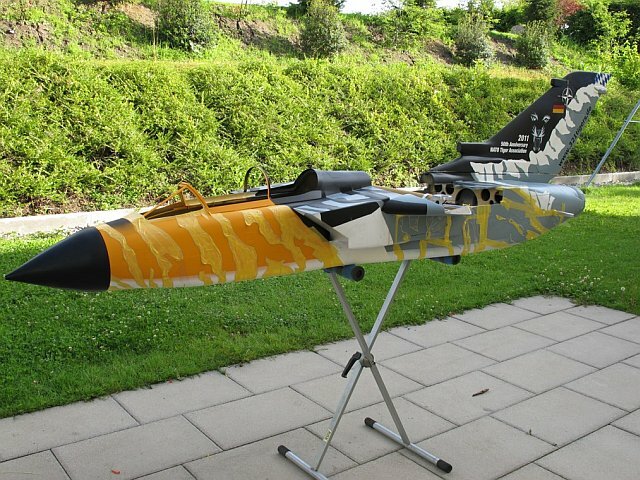 The rest of the colors on the tigerjet are based on synthetic resin from the same manufactorer as on the real jet. 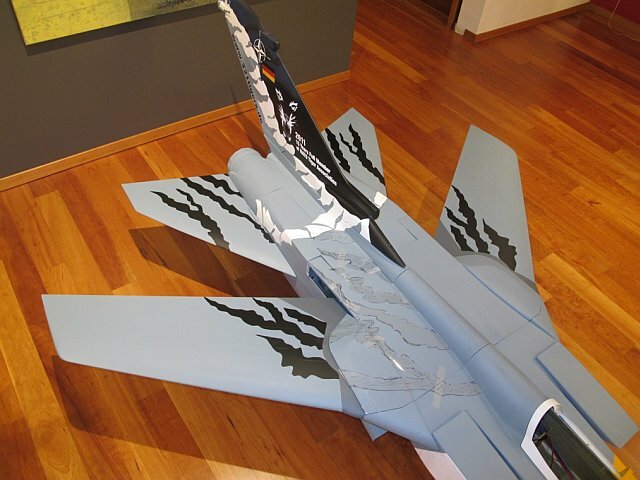 Als nächstes wurden die hinteren seitlichen Abschälungen am Rumpf angezeichnet und maskiert. 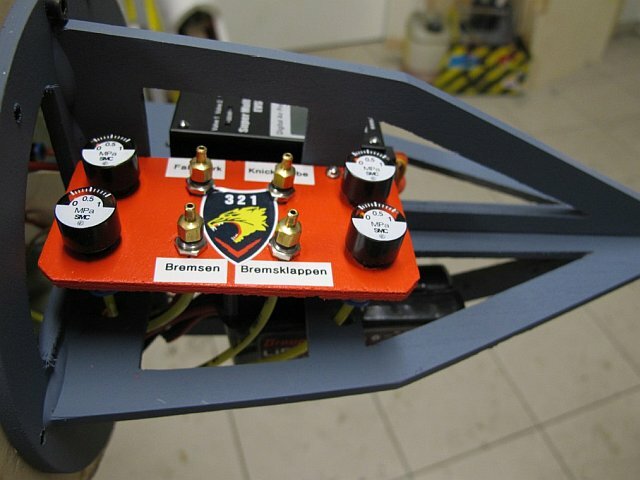 Da diese teilweise über die Speedbrakes ragen brauchte ich mehrere Anläufe bis die Dimensionen und Positionen dem Vorbild entsprachen. Dann habe ich mich den Tailerons gewidmet. 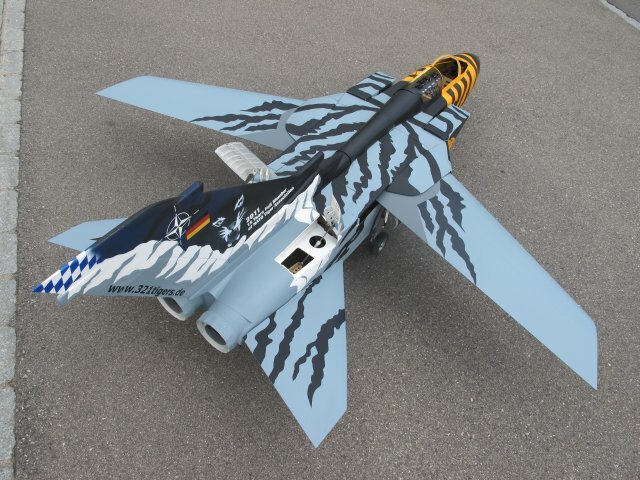 Die schwarzen Tigerstreifen sind hier links und rechts identisch. 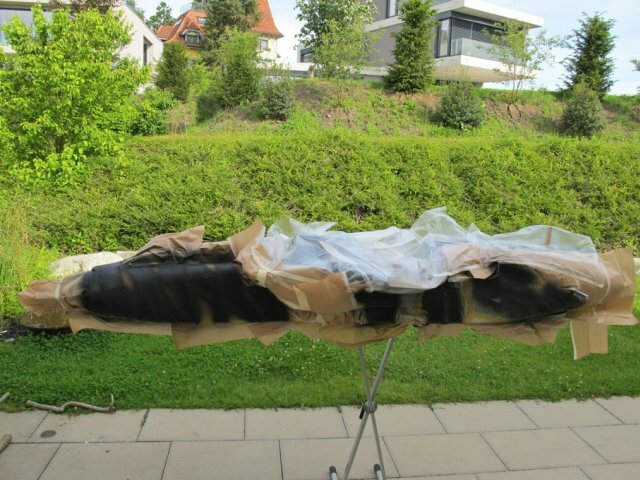 Zuerst habe ich handelsübliche transparente A4 Klarsichtmappen aufgeschnitten und so positioniert, dass ich die Umrisse der Streifen direkt auf den Tailerons bzw. auf die Folie zeichnen konnte. 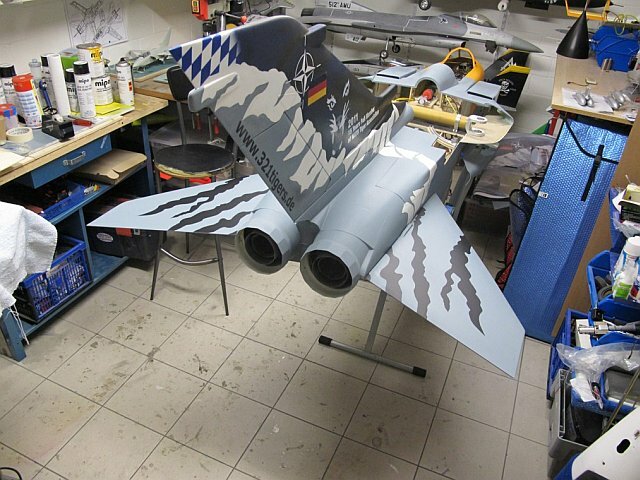 Jetzt wurde das Ganze ausgeschnitten und exakt in Position gebracht. Anschliessend habe ich die Umrisse mit Bleistift direkt auf die Tailerons übertragen. 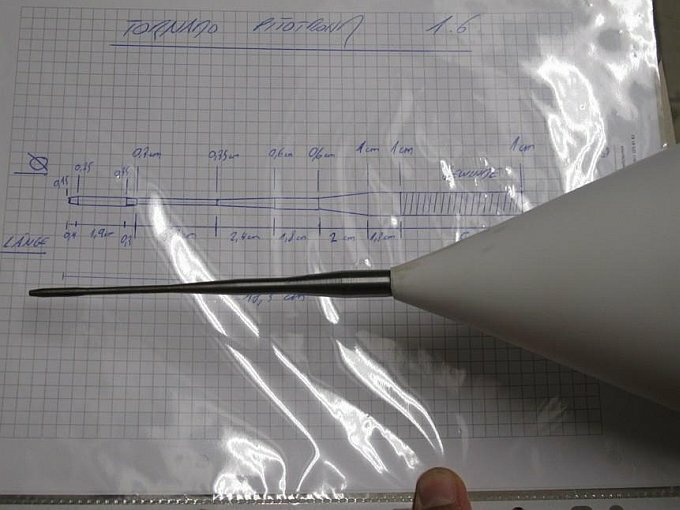 Die ausgeschnittenen Schablonen können nun gedreht werden und so kann man eine exakte Kopie auf das andere Taileron übertragen. Als nächstes habe ich mir die Tragflächen vorgenommen. 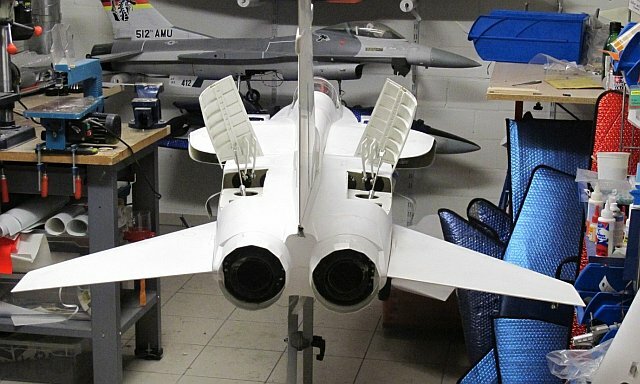 Da ich in der Draufsicht praktisch nur über Bilder in der mittleren Flügelstellung verfüge, musste ich zuerst am Modell die drei Flügelpositionen ermitteln. So konnte ich den Verlauf der Basaltgrauen Innenzone exakt ermitteln und in der Folge auch lackieren. 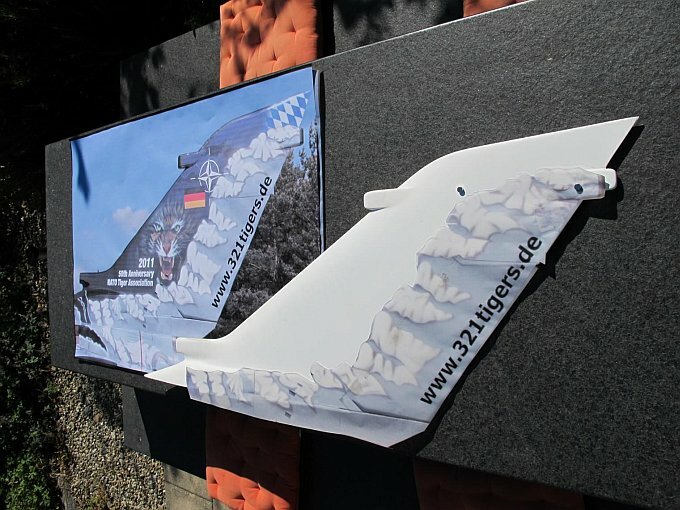 Aufbauend auf diesen Verlauf konnte ich weiter die Positionen der Tigerstreifen mit der Klarsichtfolienmethode bestimmen und so auch auf die andere Tragfläche aufbringen. Alles wieder maskiert und schon sind auch diese Streifen aufgebracht. 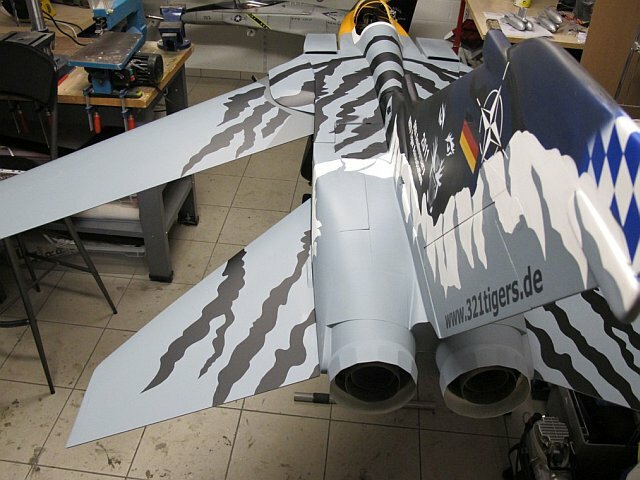 Auf dem Rumpfrücken steigt dann der Schwierigkeitsgrad was das Anzeichnen der Tigerstreifen betrifft etwas an! Immer wieder werden die vielen relevanten Bilder konsultiert und mit den verschiedensten Positionen verglichen. 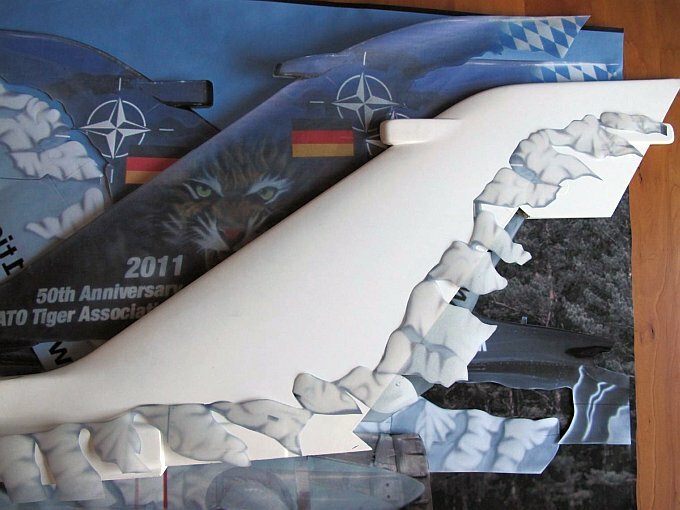 Da hat es auf den Detailbildern wie auch auf dem Modell eine Menge Deckel, Panellines, Wölbungen etc. So kann man sich zwar gut orientieren, aber weil beides nicht immer 100% übereinstimmt, auch eine Menge Fehler machen! 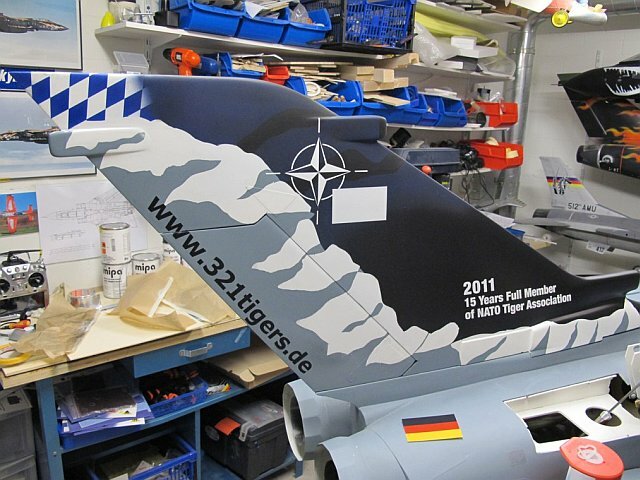 Auch hier dann wieder alles maskiert und lackiert und so schaut es schon mächtig nach Tiger aus! As everybody knows has every tiger a white belly! Because of that also mine got one - at least kind of. The fine transitions were brought into play at the end. 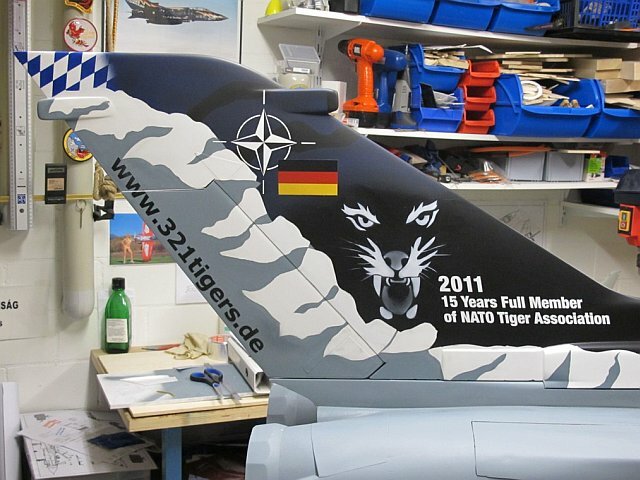 Next it was time for the tigerstripes of the fuselage sides. 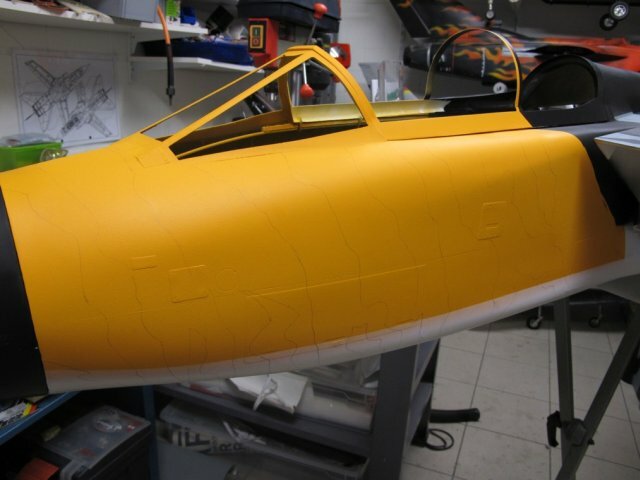 Also here I first marked the exact positions and transitions on the fuselage with transparent foil and the help of some decal dummies and the relevant pictures. 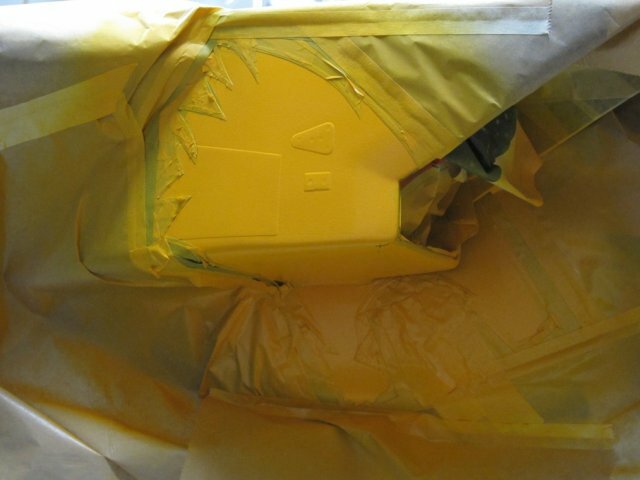 Because I had unintentionally brought up the yellow paint a little bit too dry (applied not enough thinner) I had here a lot of problems with the cling of the masking foil. With the help of magnets it worked then out nearly satisfactorily. 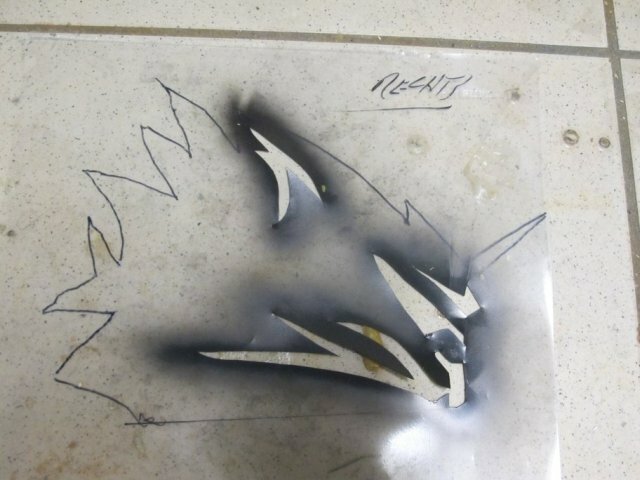 Because the pressure of the big airbrush compared to the normal one is pretty high unfortunately some black spray color got underneath the foil. 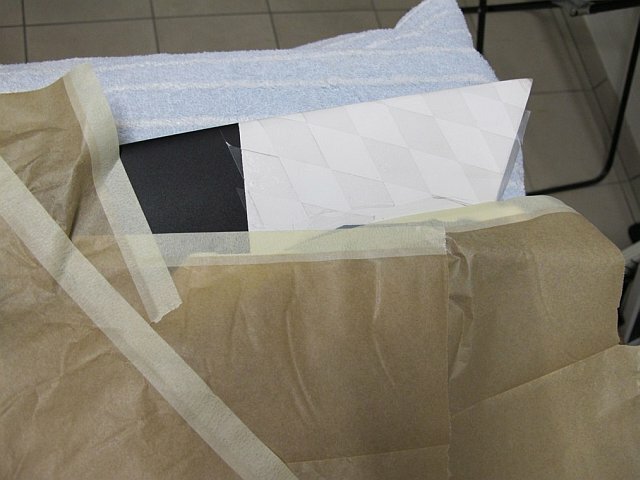 To avoid further anger I used on the other side the common procedure with ordinary tape. Thank god that there is a 3 mm so called curvy tape. This helps a lot and after some meters of practice you get the hang of it. 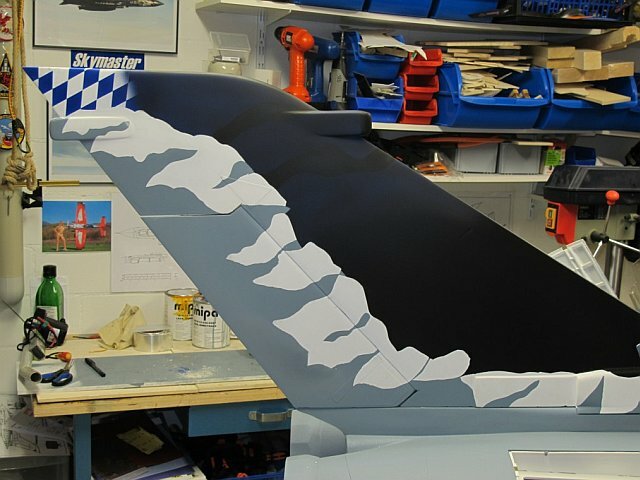 After a couple of hours of taping the whole thing was definitely ready for the airbrushing of the black zones. 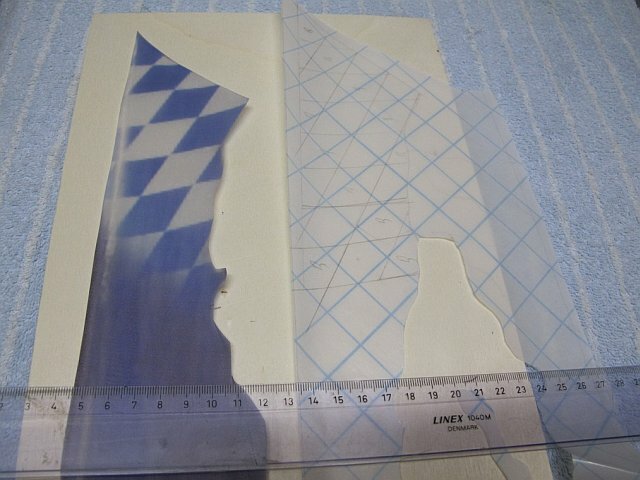 It is always a moment of high tension after the drying period when you remove the tape. Then you will see how exact your has been. Except for a couple of little spots which were easily corrected everything worked out pretty good. 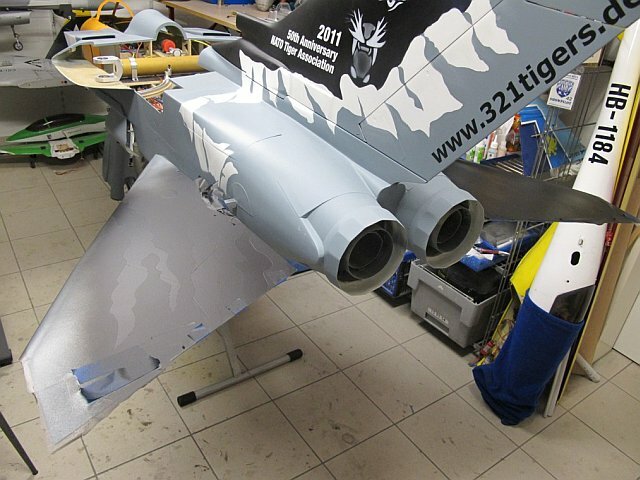 Then it was time for the two tigerheads and the stuff around the air intakes. First I had to bring up the rest of the black color around the contours of the heads. After bringing up the draft drawings a real taping orgie started. 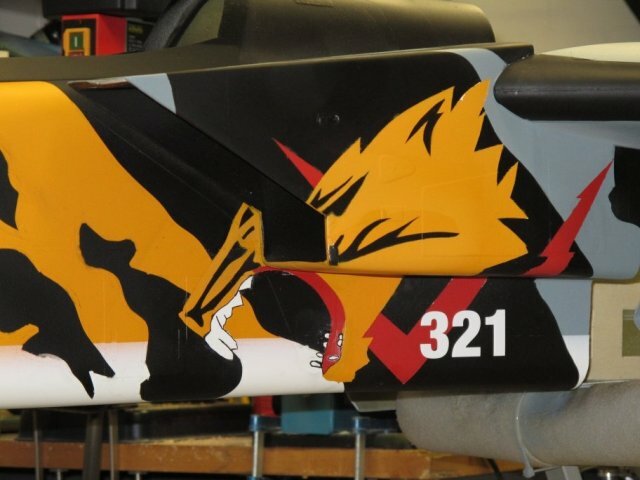 After the dryout of the yellow base color I cut out of a film the black details of the 321 Tiger and brought it up the intake with the help of masking technique. 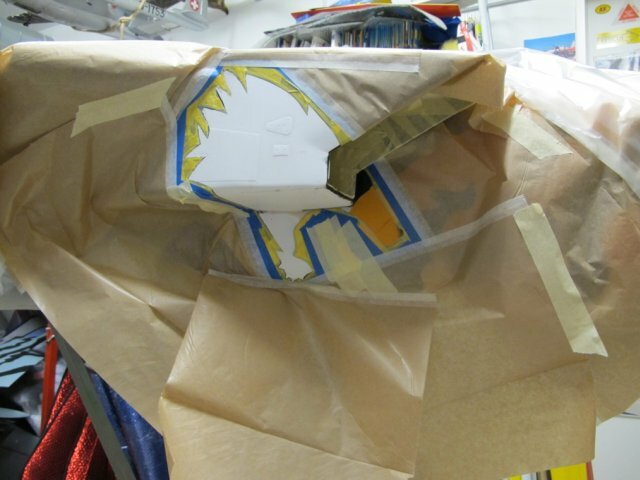 To avoid ugly fogging effects under the foil a glue is sprayed underneath before it is temporarily positioned on the tigerhead. 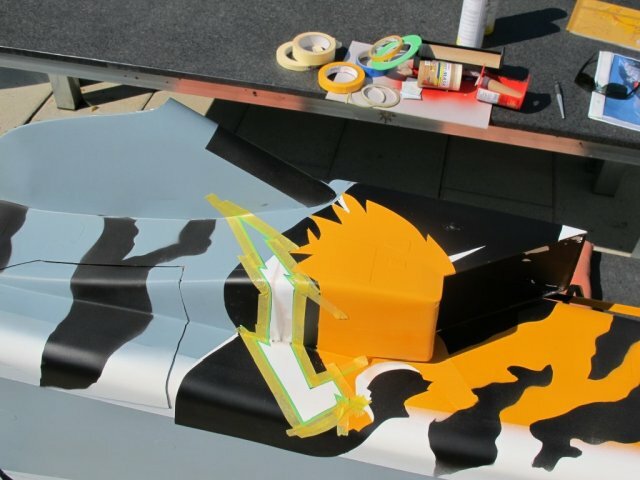 In the following step finally followed the upbringing, taping and coloring of the red flash. Now it was time for the intricacies like tongue and teeth. 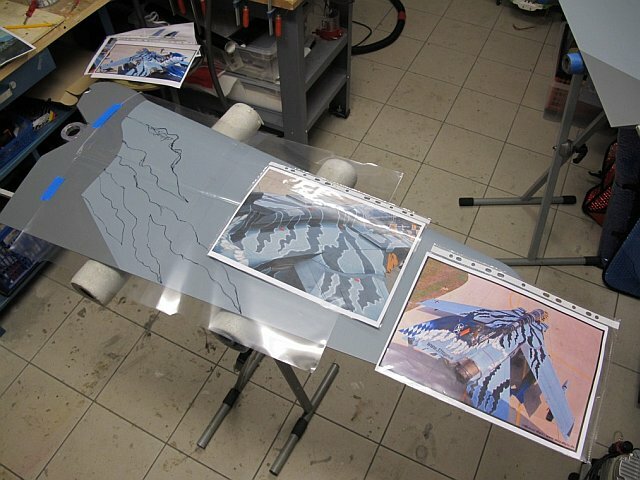 Drawing, masking, taping, coloring and the dentition is done. 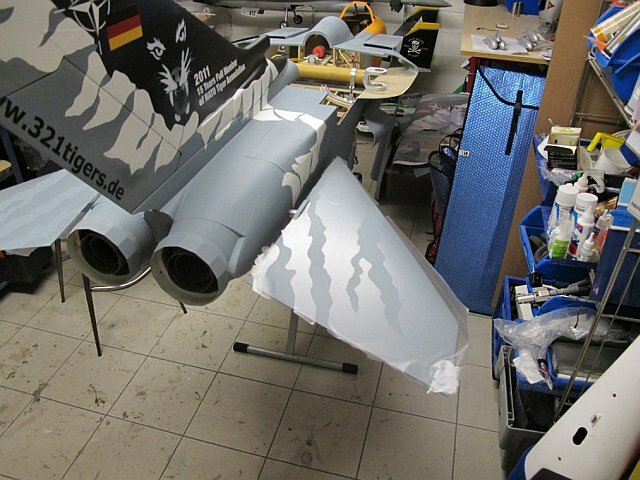 After a feeled length of 1000 m of tape, curvy tape, masking foil, cover-paper and around 15 cutting blades the project nears its completion ... finally.Nach gef�hlten 1000m Abdeckband, Kurvenband, Maskierfolie, Abdeckpapier und rund 15 Cutterklingen n�hert sich das Projekt langsam aber sicher der Vollendung�.